John Boal was born in Inglewood, California in 1940. He grew up near Los Angeles International airport (LAX) and joined the Navy in 1958. He served in Hawaii and Japan, and when he returned, he married his wife Nancy in 1961. They eventually moved to Upland, where John has worked as a real estate broker ever since. John and Nancy have three sons and a daughter and 10 grandchildren. Their son Timothy was an ALPCA member when he was a child and John brought him to many meets. 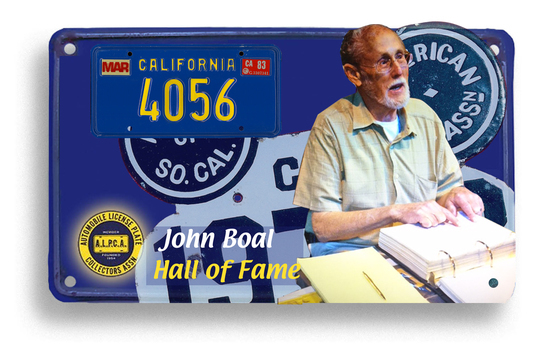 John's start collecting license plates was back in the early 1980's when he visited a museum of US Highway 101 in Morgan Hill, California. The museum was located down a hill from the Flying Lady Restaurant. There was an old barn (Quonset hut) filled with license plates from every state on the wall. Most of those plates were from the Carl Arnold (#34) collection. Many years later an ALPCA meet was held in that very barn. Not long after that he met Rick Schofield (#471) at the Pomona Auto Swap Meet. Rick saw some plates John had bought and offered to trade for any 1915 California plates he had laying on the ground. So, John says that Rick Schofield was his mentor in the hobby. As John's interest in the hobby grew, he became known as an ambassador for license plate collecting at events such as car shows, race tracks and ham radio swap meets. John attended ham radio events with large displays of ham radio plates. Hams were attracted to his displays and wanted to learn more about ham plates. John was always quick to hand out information about ALPCA and he recruited many new members at these meets. Youngsters showing interest in plates were always given some freebie tags from John's trade box. Unrelated hobbies like radio station stickers, town tags, local car dealer advertisements and military base souvenirs helped complete the story that connected the license plates displayed to regional areas of California. Nancy says she has counted more than 40 different collections of his, all California oriented. They range from match book covers to fold out postcards to fish and game licenses to name just a few. What set John apart was the explanation as to why the collectible was significant. John demonstrated that hobbies seemingly unrelated to license plates had a connection, and this connection brought more interest to license plates from people in other hobbies. At the peak of his collecting, John had the largest collection of California plates in the world, from every type/style/year made. Much of this pursuit benefitted other collectors in California as he frequently displayed plates at ALPCA meets and was only too happy to share the story and history of the tag. He was widely considered one of the most knowledgeable about California plates and could identify most anything brought to his attention. He educated a generation of ALPCA members in California, truly one of the most important but underrated aspects of club membership. Research that he initially performed years ago has been shared with other members and ended up in parts of the ALPCA archives. True to his roots of sharing the history and significance of an item, John is archiving everything he has and disposing of it to other collectors. He has photo-archived nearly 800 California pre-state plates and discs, and thousands of photos of every year, type of plate and paper material. John is a long time officer of the ALPCA Southern California region. He has been known to find some of the most unusual locations to host a plate meet. Museums, restaurants, historic homes, public parks, a military base and even a meet set up in the middle of a city street were home to John's meets. He wanted to keep meets fun and interesting, and maybe even teach some history in the process. John Boal has a historian's research mind and interest, and a collector's sense of preservation. California ALPCA members have benefitted from his membership, his knowledge, his hospitality and his enthusiasm in many ways. It is with pride that we welcome this thoughtful, generous, and knowledgeable license plate collector and historian to the ALPCA Hall of Fame.